Virgen is a community with hardworking and peace loving people. It is situated two kilometers from the Poblacion. Virgen got its name after the barangay people’s Devotion “Berhen sa Kananunayng Panabang” (Mother of Perpetual Help) whom the barangay people honor and celebrate annually every month of April. Barangay Virgen was once a part of Candabong. It was separated from Candabong in the year 1947 and it was directly declared as barrio upon the request of the people headed by Mr. Tiburcio Escobido, who headed the community during that time and later became the first barangay chairman. Within that year, a school was constructed under the leadership and support of the late Mayor Aquilino Deligero. It aimed to develop and eradicate illiteracy among the parents and their children. Mostly of the barrio people are engaged in farming, fishing and mat weaving for women. The land is naturally a rocky that is why most farmers plant corn, bananas, vegetables, mangoes, vegetables, root crops, among others. To date, Barangay Virgen has a total population of about 1,297 and 302 households. Barangay Virgen also blessed with natural resources and potential tourist sites. From the beautiful white sand of Bito-on Beach take a glimpse of different Caves with spring dotted in the area. By now, Barangay Virgen is not anymore a despondent area for it is notably advancing with the government thrusts, aimed towards economic, educational, political and social programs. Barangay Councilors Agaton D. Felisilda Ma. Gina B. Felisilda Arsenio F. Lingutan Josefino L. DelaPeña Dindo E. Macato Hermocilo M. Liga Mariano E. Makinano Jr.
SK Kagawads Jeah C. Dingal Maxwell E. Amplayo Annaliza D. Tuling Rodel O. Elardo Jaclyn G. Escobido Dinnes N. Balabat Estanislao A. Escobido Jr.
BEACH COMBING – Barangay Virgen is also noted for its white sand beaches and pristine crystal clear water that surely everyone would enjoy basking the sand, snorkeling or diving in the glamorous and beautiful coral reefs. It has developed 4 beaches. These are Coastal Paradise, Family Beach Resort, Bito-on Beach Resort, and Flower Beach Resort. VIRGEN CAVES – Barangay Virgen has 3 natural caves/cold water to take a bath. These are Convento Cave, Kaligo-on Cave, Kaligo-on Gamay. These caves are packed in one area, in Proper Virgen before reaching Bitoon Beach Resort. MILLENNIUM TREE – Located on your way to Flower Beach Resort. Reportedly one of the oldest trees in the Municipality of Anda, this huge Balete tree is estimated to be more than a thousand years of age. Just beside this enchanting tree is a cave which laces fascinating rock formations, stalactites and stalagmites where once can experience the thrill in conquering the mystery unveil by Mother Nature. DIVING OASIS – Neophytes in diving will do their first steps under water, are trained to proficiency by German dive instructor of Flower Beach Resort and his crew and finally earn the first worldwide accepted dive license (PADI or CMAS). More than the usual sun, sea and sand destination. Barangay Virgen and the rest of the coastal barangays of ANDA are haven for diving and snorkeling enthusiasts. 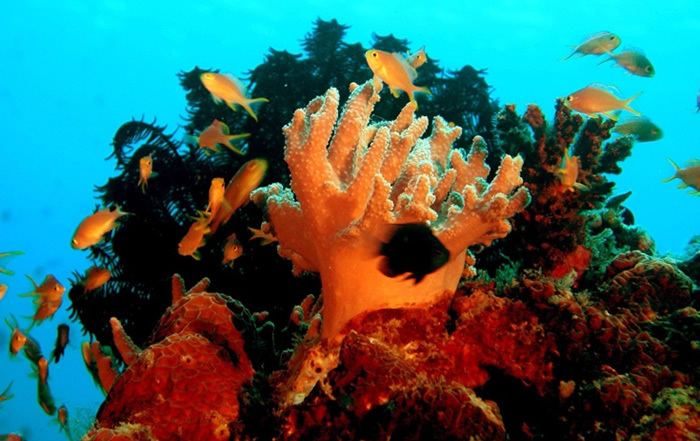 It is now a promising diving destination in the province and in the region because of its spectacular coral gardens and a cornucopia of marine life. MAT & BASKET WEAVING – Most of the women in this barangay are engaged in Mat Weaving, Basket Weaving made in Bamboo and other indigenous materials. INAHAN SA KANUNAYNG PANABANG FIESTA CELEBRATION – Held every April 25-26. This will highlight Grand Disco, Singing Contest, Nightly Show, among others. DAYGON CONTEST & BELEN CONTEST – Held every Dec. 25. It features different competing groups singing Christmas Songs as well as belen by different puroks that surely one would fill the air with fun while celebrating the yuletide season.